Another classic game gets a face-lift. 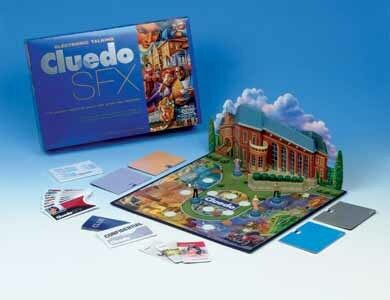 Cluedo, the family favourite is now even more fun. This luxury edition includes an interactive and touch-sensitive game board that guides you around the grounds of Tudor Mansion, tracking everyone's moves. Special sound effects give you extra clues as you move around the board. All the usual suspects are still included, but this edition also introduces new characters and locations. Dr Black's butler, Mr Ash, narrates the mystery and guides the players around the grounds of Tudor Mansion. The touch-sensitive gameboard keeps track of every move you make as you search the grounds for hiding suspects and listen out for sound effects that may be helpful in your investigation. Each of the suspects will also tell you what they know about the crime - perhaps Miss Scarlett knows that the murder weapon wasn't a tennis racquet, and Colonel Mustard might be able to tell you that the murder didn't take place in the garage. Maybe Reverend Green can prove that Rusty the gardener did not commit the crime? Keep track of all the clues and help Inspector Brown solve the case. And, once you've solved one crime you can play again and again - as a new mystery begins every time you play. It's odd, but it is amazing the difference a bit of electronic wizardry can make to an old favourite. 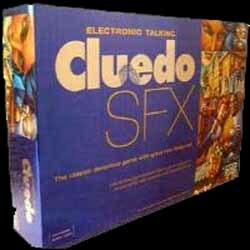 I always loved Cludeo, but haven't played it for a few years. This version of the game took me back to being a child all over again. If you already own, and love, a copy of the old original, then you really should pick up a copy of this. It truly is a game that all the family will really enjoy.